So that was intense. The three NFL games with the most meaning yesterday – Packers-Bears, Chiefs-Chargers (after Miami and Baltimore lost earlier) and Eagles-Cowboys all went down to the wire and were decided in the final minutes. 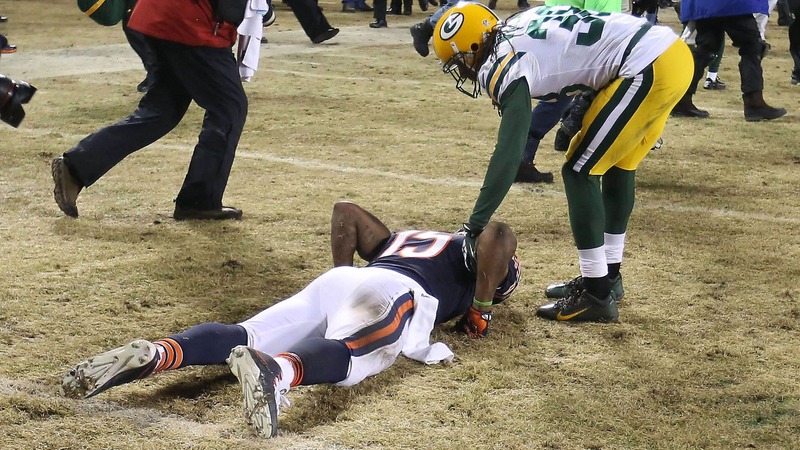 The agony for the losers was best summed up in this picture of Bears wide receiver Brandon Marshall after Green Bay beat Chicago on Aaron Rodgers’ 48-yard touchdown pass to Randall Cobb on 4th-and-8 with 38 seconds left in regulation. * It was a very rough night for Cowboys owner Jerry Jones, who couldn’t hide his various emotions. * On the flip side, this hilarious Eagles fan — Mr. G — couldn’t have been happier with Philadelphia’s win. * We’ve seen plenty of fans run on the field during a game, but the guy who crashed the 49ers-Cardinals game took his performance to another level. * Mike Ditka fell asleep during "ESPN Countdown" yesterday. Or Lance Moore’s suggestive dance? After seeing the championship belt LeSean McCoy wore after the Eagles beat the Cowboys, LeBron James took to Twitter to announce that he’d like one, too. A couple of guys came through for him. @KingJames Got your back. I'll take care of it tomorrow and hit ya back off line. Done. A pair of Alabama fans have named their daughter Krimson Tyde. The Wisconsin Badgers football team had their reaction to the end of the Packers-Bears game filmed. For maximum amusement, keep an eye on the player in the Matt Forte jersey. No Coast Bias recaps a very weird sports year. Model Teresa Moore gets today’s Fox-y Lady honors.